Since medieval times, unicorns have been associated with young girls, seen as a symbol of innocence and purity. This Ride A Unicorn costume is for those who just need to find a beautiful supernatural wonder and plop themselves down on it! Carry me around, innocence and purity! 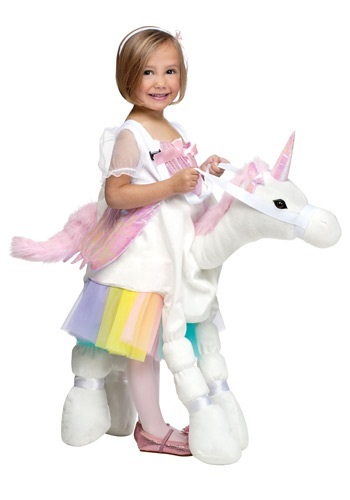 When your little angel wears this Ride A Unicorn Costume, she can ride headlong into her favorite fairy tale! It’s not known if legends of unicorns originated with rhinoceroses, single-horned goats or deer, or simple fabrication, but you can let your little one go on believing whatever she wants. This Ride A Unicorn costume is as authentic as they come.